Throughout UBC Botanical Garden, both wild deciduous and evergreen species as well as cultivated selections of magnolias are prominently displayed. In the David C. Lam Asian Garden, Asian Magnolia species stand out against a background matrix of native conifers, shrubs and ground covers, maples and rhododendrons, while in the Carolinian Forest Garden, Magnolias vie for space with a diverse mixture of eastern North American deciduous hardwood species. While there are some 200 or so species of Magnolia in the world, we are capable of cultivating fewer than half of them in the Garden, as the majority hail from the subtropical mountain forests of Southeast Asia and Central and South America. 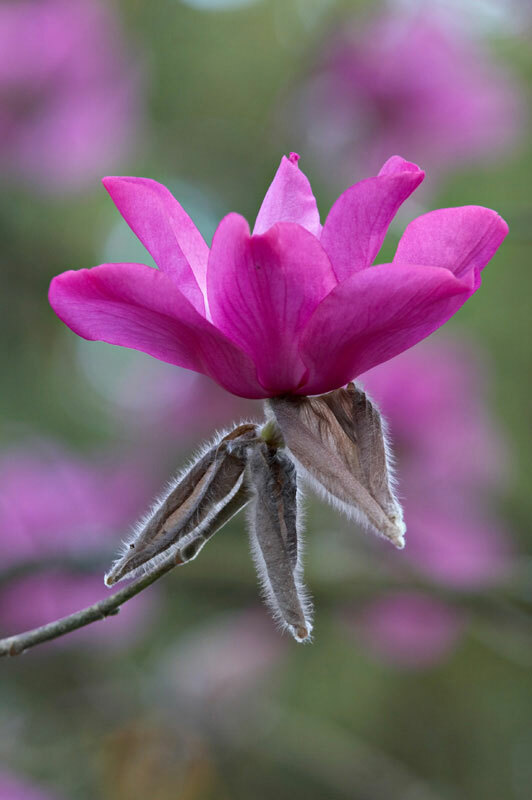 The temperate magnolias are found in east Asia and eastern North America and of these, the Garden counts about 45 species, the majority from Asia. In the Garden, there are about 20 evergreen species from China and Vietnam, most of them little known in cultivation. Magnolias were once thought to be among the most ancient of flowering plant lineages. That distinction properly goes to the water lilies and a few other mostly smaller, aquatic plants. Nevertheless, there are a number of characteristics that indicate that magnolias are older than many flowering plant groups, including that the flower parts are both profuse and spirally arranged, and that the numerous, showy, outer flower parts (tepals) are not differentiated into separate sepals and petals, features that more recently evolved plants commonly display. As well, Magnolia flowers are pollinated exclusively by beetles; they are not adapted to pollination by bees or other more specialized insects. The largest of Magnolia flowers are found on deciduous species, in particular, on species in the Asian Magnolia subgenus Yulania. Magnolias in this group produce flowers on naked stems in very early spring, before leaf emergence. This group is particularly well represented in the David C. Lam Asian Garden and plants in bloom—many of which are large trees, 10 m tall or more—typically elicit much picture taking and gasps of pleasure by garden visitors. The eastern North American M. macrophylla and M. ashei (small plants in the Carolinian Forest Garden) have flowers that rival the yulanias in size and fragrance, but they are mostly white and produced later in spring after leaves have already unfurled.